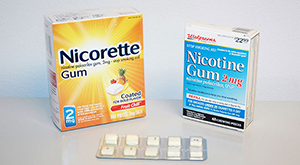 The 2008 United States Public Health Service guidelines for quitting smoking or chewing tobacco recommend a combination of counseling and medication. The following seven medications are approved by the FDA for that purpose. 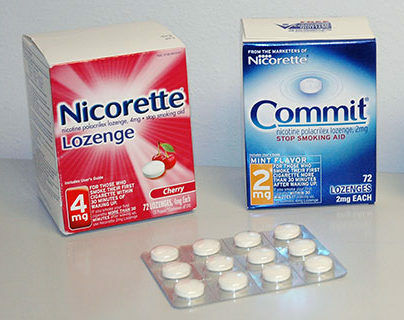 See FDA packaging for more complete information. 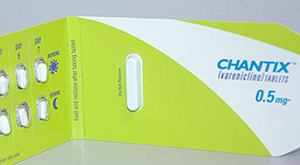 This is the latest medication approved by the FDA for smoking cessation. Only available via prescription. It delivers nicotine through your nose. Recommended use is up to two sprays an hour. Only available via prescription. 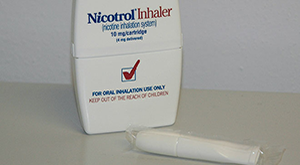 Patients "puff" small doses of nicotine through this product that looks similar to a cigarette. 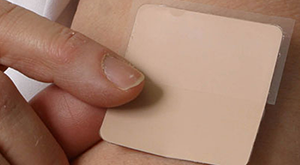 Nicotine patches are designed to provide a steady stream of nicotine through your skin over a designated time. 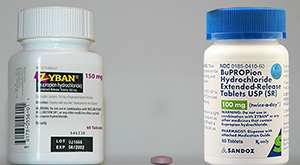 Bupropion SR is a prescription pill marketed under the brand name Zyban. It is also available generically. Available without a prescription. It is recommended for smokers who want something to turn to when experiencing urges to smoke. This medication is available over the counter. It is usually used for eight to 12 weeks. There’s no magic medication to cure addiction to nicotine. However, these medications can increase your chances of quitting two- or three-fold. It’s important to discuss any medication with your doctor to be sure you’re using it safely, at the correct dosage and for the appropriate duration. Your insurance company may cover these medications. For more information, click here. To read about Medicaid coverage for quitting smoking, click here.